Mention studying to most gun owners and images of target shot groupings or the latest issue of Guns and Ammo spring to mind. However for the serious concealed carry practitioner, intent on honing their skills, studying is more than visiting the shooting range and leisure reading. Developing a proficiency in situational awareness and conflict avoidance, as well as learning to recognize alternative options in potentially dangerous situations, all require a certain amount of diligence. 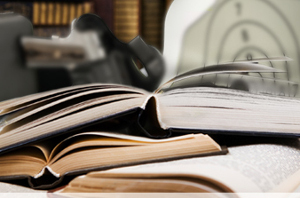 Michalowski recommends several books that are beneficial for people who carry concealed. The Gift of Fear by Gavin de Becker is high on his list. This book concentrates on helping the reader understand personal limitations, fears, and likely reactions in order to overcome, or at least recognize said fears when a dangerous situation presents itself. Another book on Michalowski’s recommended reading list is In the Gravest Extreme by Masaad Ayoob. This book is a guide to legal and ethical issues that may arise from gun ownership. For the concealed carry community, these issues are particularly relevant. Going to the shooting range to practice is a great idea, but it becomes less productive if you don’t know which body parts and organs you should fire at in order to neutralize a threat. Michalowski recommends purchasing an inexpensive wall chart showing the human anatomy. By taking a few minutes now and then to study the chart, you will soon get a feel for where to aim. In an actual firefight, the goal is to bring the subject down as quickly as possible, not to aim for a good grouping. A little more time spent studying will result in improved confidence and preparation not only on the range, but on the street as well.